نجاتی کلاته, علی, روشندل کاهو, امین. (1392). تعیین مرز داده‌های میدان پتانسیل با استفاده از تصویرسازی زاویه تتا. مجله ژئوفیزیک ایران, 7(1), 24-33. علی نجاتی کلاته; امین روشندل کاهو. "تعیین مرز داده‌های میدان پتانسیل با استفاده از تصویرسازی زاویه تتا". مجله ژئوفیزیک ایران, 7, 1, 1392, 24-33. نجاتی کلاته, علی, روشندل کاهو, امین. (1392). 'تعیین مرز داده‌های میدان پتانسیل با استفاده از تصویرسازی زاویه تتا', مجله ژئوفیزیک ایران, 7(1), pp. 24-33. نجاتی کلاته, علی, روشندل کاهو, امین. تعیین مرز داده‌های میدان پتانسیل با استفاده از تصویرسازی زاویه تتا. 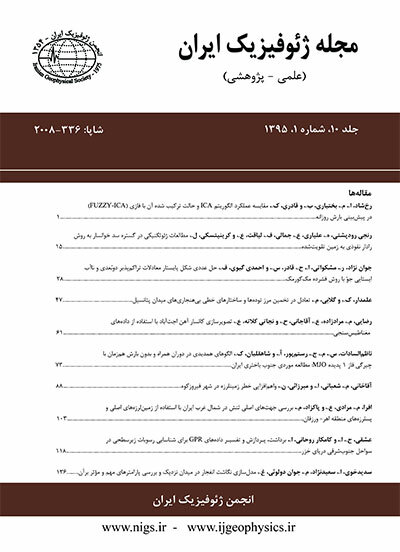 مجله ژئوفیزیک ایران, 1392; 7(1): 24-33. تقویت لبه‌ها در داده‌های میدان پتانسیل می‌تواند به تفسیر داده‌های زمین‌شناسی کمک شایانی کند. تاکنون روش‌های متعددی برای افزایش توان تفکیک لبه‌ها عرضه شده است که اکثر آنها فیلترهای بالاگذر براساس مشتقات افقی یا عمودی - میدان هستند. محاسبه فاز محلی میدان پتانسیل ابزار مفیدی برای تشخیص لبه‌ها است. زاویه شیب در ایجاد توازن میان دامنه بی‌هنجاری‌های متفاوت موثر است، اما گزینه اول برای تشخیص لبه نیست. گرادیان کلی افقی زاویه شیب با موفقیت لبه‌های بی‌هنجاری با دامنه بزرگ را به‌خوبی تشخیص می‌دهد، اما نتایج آن در مدل‌های عمیق‌تر کمتر قابل‌‌ملاحظه است. تصویرسازی زاویه تتا از دامنه سیگنال تحلیلی برای نرمال‌سازی گرادیان کل افقی استفاده می‌کند. در این مقاله، کارایی سه روش پیش‌گفته روی داده‌های مصنوعی و واقعی مورد بررسی قرار گرفته است. نتایج نشان می‌دهد که روش تصویرسازی زاویه تتا لبه بی‌هنجاری‌های عمیق‌تر را از سایر روش‌های ذکر شده بهتر تفکیک کند. Potential field images obtained in potential field data measurements are appropriate tools to explore mineral and hydrocarbon resources. These images consist of different anomalies which in many cases are contaminated with noise. The horizontal location of the boundaries of the potential field anomaly sources is a frequently requested job in potential field interpretations. However, the edge of the potential field sources is not clear-cut as the anomaly shape is not of enough resolution with respect to the shape of their sources. Edge enhancement in potential field data helps geologic interpretations and investigating the structural setting of a region as well as environmental and engineering applications. Edge enhancement is a procedure, applied to the potential field data to produce regions of constant field amplitude separated by sharp boundaries as an aid to the interpretation. There are many methods to enhance the edges of potential anomalies, most of which are high-pass filters based on the horizontal or vertical derivatives of the field. Vertical derivatives have been used for many years to enhance the measured gravity field. Measures of the local phases of the potential fields can be a useful aid to edge detection. An alternative approach to the conventional phase filter is the tilt angle. The tilt angle is the ratio of the first vertical derivative to the horizontal gradient and is effective in balancing the amplitudes of the different anomalies, but it is not primarily an edge-detection filter. The total horizontal derivative of the tilt angle (THDR) successfully delineates the edges of the largest amplitude anomaly, but its results for the deeper bodies are less impressive. The most interesting characteristic of all these methods is that it is possible to get quantitative results on gridded data with only a few assumptions. One of the main limitations to making a good estimate of the boundary position of a source are interference effects caused by nearby sources, especially when they are deep-seated. Comparing different filters in order to detect the local phase edges, Pilkington and Keating (2004) showed that these filters cannot enhance all of the parameters of discontinuities. The theta-map method is presented here as a high-resolution boundary-analysis technique. Theta is the angle between the analytical signal and its horizontal component. The theta map uses the analytic signal amplitude to normalize the total horizontal derivative. This filter enhances the edges of anomalies of all azimuths. We tested the efficiency of this method on both synthetic and real data. We selected two nearby sources with different depths as a synthetic model. We also tested the method against gravity data over Trompsburg complex located in the Free State Province, South Africa. Trompsburg Complex is roughly circular in shape, a layered mafic intrusion, with a diameter of nearly 50 km. Results show that the theta-map method can enhance the edge of a deeper anomaly better than the tilt-angle or the total horizontal derivative of the tilt angle methods. Also, the anomalies edge detection by the theta-map method is more accurate than the two other methods. This method has a better resolution than two the other mentioned methods. حدادیان، ا.، 1390، شناسایی مرزهای بی‌هنجاری گرانی با استفاده از فیلترهای فاز محلی، پایان‌نامه کارشناسی ارشد، دانشکده معدن، نفت و ژئوفیزیک، دانشگاه صنعتی شاهرود. برگه زمین‌شناسی 100000/1 منطقه ساوه، سازمان زمین‌شناسی و اکتشافات معدنی کشور. Cooper, G. R. J., and Cowan, D. R., 2006, Enhancing potential field data using filters based on the local phase: Computers & Geosciences, 32, 1585–1591. Fitzgerald, D., Yassi, N., and Dart, P., 1997, A case study on geophysical gridding techniques: INTREPID perspective: Exploration Geophysics, 28, 204–208. Mare, L. P., and Cole, J., 2006, The Trompsburg complex, South Africa: A preliminary three dimensional model: Journal of African Earth Sciences, 44, 314–330. Miller, H. G., and Singh, V., 1994, Potential field tilt—A new concept for location of potential field sources: Journal of Applied Geophysics, 32, 213–217. Pilkington, M., Keating, P., 2004, Contact mapping from gridded magnetic data - a comparison of techniques. Exploration Geophysics, 35, 306-311. Roest, W., Verhoef, J., and Pilkington, M.,1992, Magnetic interpretation using the 3-D analytic signal: Geophysics, 57, 116–125. Verduzco, B., Fairhead, J. D., Green, C. M., and MacKenzie, C., 2004, The meter reader—New insights into magnetic derivatives for structural mapping: The Leading Edge, 23, 116–119.